Bill de Blasio. He will be the 109th Mayor of New York on 1 January 2014. He won by a landslide, with his Republican opponent only scraping a small percentage of the overall vote. To be honest, I’m not sure I’d have even known about the election yesterday, it was so low key around here. R said it was because the Democrat was so likely to get in that it would have been a waste of money to plaster the place with posters. There are 4.3 million voters in New York; 700,000 of them are registered Democrats, so I suppose that makes sense, but even so, there hasn’t been a Democrat mayor in 20 years. I saw a lonely de Blasio poster out in Queens on Monday and a lot of City Councillor posters locally and that was about it. Public school kids got the day off as their buildings got used as polling stations. R shook hands with Joe Lhota and Rudy Guliani (Mayor before Bloomberg) who were hanging around the subway station in the morning, which was about as exciting as it got. Here’s today’s newspapers, just to prove it actually happened. 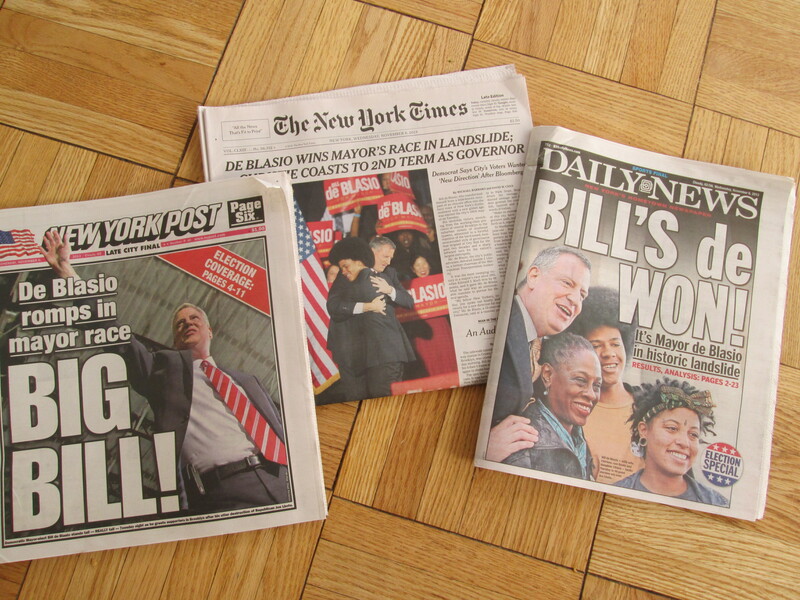 Categories: Elections, US politics | Tags: Bill de Blasio, Joe Lhota, New York Mayor election, Rudy Guliani | Permalink.